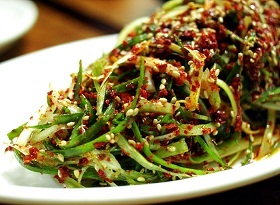 Pa muchim is a fresh, delicious scallion salad dish often served alongside grilled meat (usually when eating samgyupsal) at Korean BBQ restaurants or even at homes. Other common ingredients that are present and used to make this side dish is sesame oil, sesame seed, and gochugaru. Pa muchim can be consumed alone but usually added to lettuce wraps (ssam) which may include but not limited to pieces of BBQ meat and/or seafood with a dab of ssamjang, gochujang and/or dwenjang. To see a visual illustration, click here.